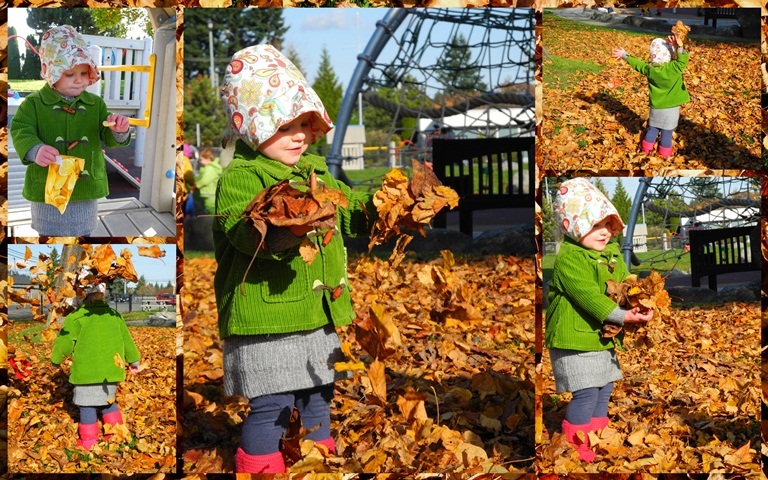 Our trip to the park yesterday involved lessons in playing with autumn leaves. 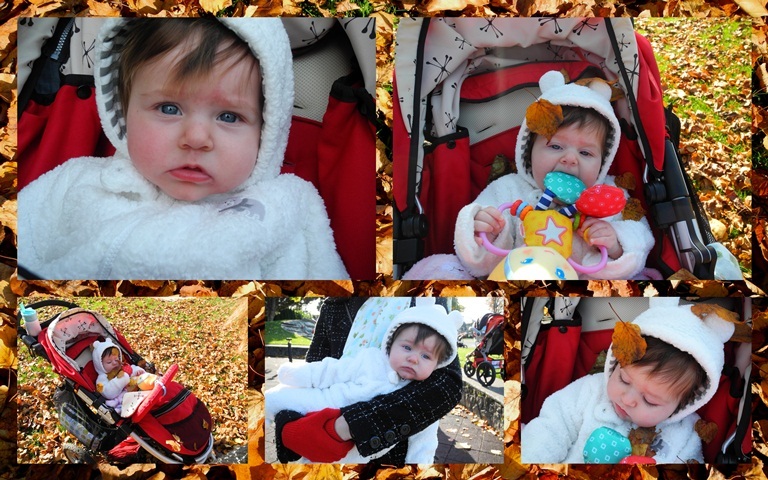 Little Miss S just watched from her stroller, unperturbed by the leaves falling all around her. Next year, she'll be in on all the fun. Little Miss A watched her mother and aunt throwing leaves and soon got in on the action, too. Up in the air went her arms, down came the leaves and she giggled. "Again, again," she said. Up there in the corner is one of the snack bags I made. With her little hands she can reach inside and get her snacks. I'm pleased with the way it turned out. I'm not wanting this to turn into a baby blog, but lately, I'm spending a lot of time with these two sweeties and not getting too much else done, other than teaching. We'll see what happens this next week. The sunshine is glorious today. Frost last night left my dahlias black and droopy. I cleaned them up, along with a few other perennials. Tim mowed the lawn, hopefully for the last time until March. This afternoon we hope to get outside for a walk. It's not that your blog is turning into a "baby blog." These precious granddaughters are a big part of your life. What is not to love? I think it's great! You will hear no objections from me about your blogging about the babies in your life. Except that I'm a little jealous. I need to be patient -- my oldest just turned 21 and hasn't finished college. All in good time, right?Your granddaughters are darling and make good eye candy! Your little grands are so cute!! Such sweet little girls ... and so colorful! What better way to invest your time, right? Oh I adore reading about those sweet babies. Please don't stop. I remember how much my own little girl loved playing in the leaves. She loved for her daddy to rake leaves in a pile so she could jump into them. Memories! You don't need to rationalize or apologize for showing us these photos! Pas de problème si tu montres des photos de ces deux adorables choupinettes ! Quelle plus grande joie que de jouer dans les feuilles en automne, à tout âge ? Et je sais ce que c'est de ne pas avoir beaucoup de temps pour autre chose. Ce n'est pas grave et lire ton blog est toujours très agréable. So beautiful and so colourful.